In this article, we’re going to review some of the hottest head shavers on the market. All of the shavers listed below are easy-to-use, comfortable, and have many positive reviews on trusted websites like Amazon. By the time you’ve finished with this piece, hopefully, you’ll have a better idea what the best head shaver is for your lifestyle. We’ve also included a few traditional head razors on this list for readers who are into wet shaving. Note: all of the head razors listed are arranged from the least to the most expensive. 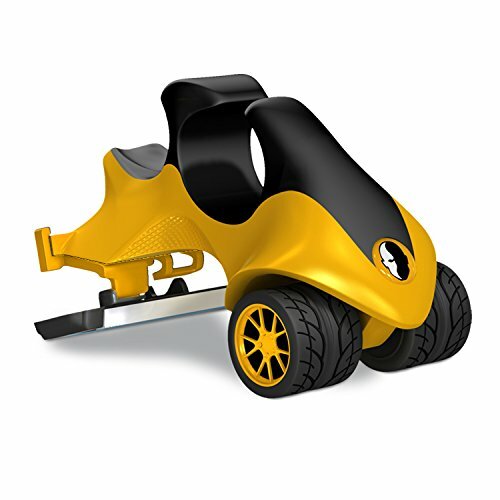 The most popular head razor from the Headblade company is called the ATX All Terrain Head Razor. This unique blade design has soft wheels in the front and a four-blade cartridge in the back. You simply place your hand in the central cushion and glide this razor against your head hairs. Although you get a HB4 blade with the ATX All Terrain Head Razor, you can also use an HB6 blade. Please keep in mind this razor is designed for people who already have a bit of experience with safety razors. You might have to take a bit of time to get used to the Headblade ATX if you’ve never shaved your head with a razor before. Out of over 700 reviews, the Headblade ATX has an average score of 3.5 stars. You can order the Beadblade ATX Razor for only $15 on most websites. Although this product is cheap, you have to factor in the cost of shaving gel and blades that you’ll have to replenish continually. Simply put, you have to be a fan of wet shaving to get the most use out of the Headblade ATX. Ergonomic handle and comfortable front wheels. Compatible with HB4 and HB6 blades. Cuts extremely close to the skin; you need to take your time. The dimensions of the ATX All Terrain Head Razor are as follows: 5 x 4.2 x 3 inches and a weight of 2.88 ounces. You can choose from five colors such as yellow, black, or blue. Yet another product from HeadBlade is the MOTO Head Shaver – LE Military. This slightly higher-grade product uses both HB4 or HB6 blades. 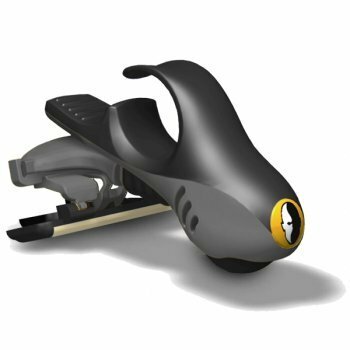 Designed with a dual-axis suspension system, the HeadBlade MOTO can naturally curve with your head. There’s also a finger ring on this product to help you direct the blade into difficult-to-reach areas like behind the ears. The MOTO Head Shaver won numerous awards in the past few years for its design and has many glowing reviews from customers online. As of today, the MOTO Head Shaver has an average score of four stars on Amazon out of about 120 reviews. You can order the Headblade MOTO Head Shaver – LE Military for low price tags on most online retailers. By the way, Headblade donates a portion of every purchase to the SSG Travis Mills Foundation for wounded veterans. Without a doubt, Headblade’s product is the best head shaver for experienced wet shavers. Those who want a safe traditional razor experience for an affordable price will love it. Can use both HB4 and HB6 blades. Portion of purchase helps wounded veterans. Handle could snap off after repeated use. Requires experience with safety razors. The MOTO Head Shaver – LE Military measures 4 x 2 x 5 inches and weighs about 0.6 ounces. You can choose from seven different color designs including red, blue, black, and yellow. The HATTEKER company has a highly praised 5-in-1 waterproof electric shaver on the market able to handle head & beard shaving as well as nose hair trimming. 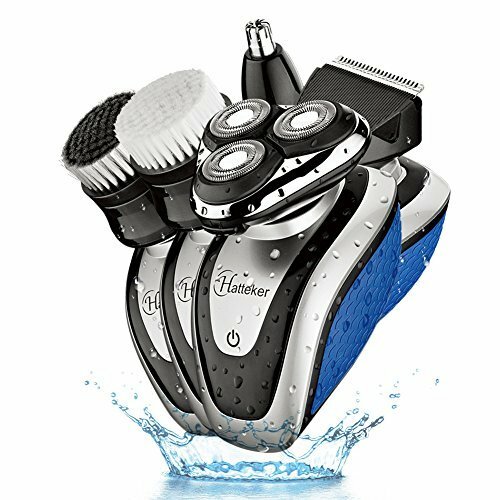 In addition to the standard shaver & trimmer head, HATTEKER includes a brush for facial cleaning, a special trimmer, and a triple head shaver. Head shavers will love the floating rotary shaver for its ability to contour to your head. The HATTEKER Men’s Electric Razor is rechargeable thanks to its long-lasting lithium battery. After about one hour and a half of charging, you can use the HATTEKER for about 60 minutes. Every HATTEKER Men’s Electric Razor package includes a UL adapter for this purpose. This electric shaver is in the mid-range of price ags. Everyone who purchases a HATTEKER Men’s Electric Razor also receives a one-year lifetime warranty. Out of about 40 reviews, the HATTEKER Men’s Electric Razor has a 5 star rating. HATTEKER’s Men’s Electric Razor is the best head shaver for men who do a great deal of traveling. If you are looking for a portable and reasonably priced multi-use electric shaver, the HATTEKER might be just the thing for you. Rechargeable lithium battery with a UL adapter. Only takes 90 minutes to charge fully. 5-in-1 design with one contouring rotary top. Portable design; plus includes travel pouch great for frequent fliers. Men with bigger hands might have difficult gripping on this razor. The HATTEKER Men’s Electric Razor weighs about 1.3 pounds. Each one of these electric razors is powered by one X Li-ion battery of 14500-700mAH power. HATTEKER Men’s Electric Razor has wet/dry capabilities and is only available in a blue design. 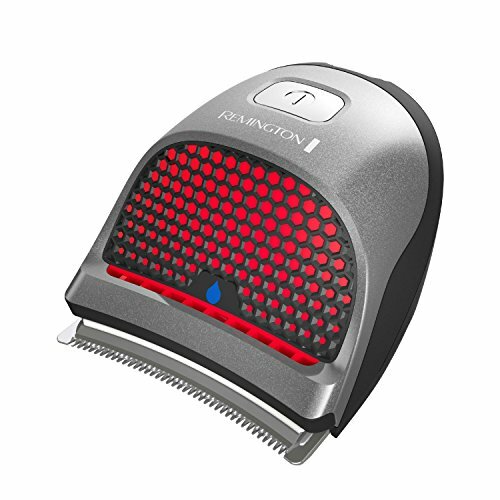 Remington’s HC4250 Shortcut Pro is one of the most popular waterproof electric head shavers online. With a score of four stars out of approximately 2,400 reviews, there’s no doubt the Remington HC4250 is one of the head shaving community’s favorite tools. This electric shaver uses professional stainless steel blades and includes 9 combs that are able to cut anywhere between 1/16 – 5/8 inches. The ergonomic handle helps men sculpt their head and neck hair to their desired level. In addition to the combs, you also get a travel pouch, a brush, and a charging adaptor. Speaking of a charging adapter, the lithium battery in this razor is rechargeable. After four hours of charging, you can use the Remington HC4250 for 40 minutes. There’s also a five-minute “quick charge” feature you could use to power up the HC4250 for one fast shave. One of the highest reviewed head shavers. 9 shaving length combs available. “Quick Charge” feature convenient for a fast shave. Takes four hours to fully charge. Remington HC4250 measures 9.8 x 7 x 2.5 inches and weighs 1.2 pounds. In total, there are 13 attachments and accessories included with this blade. The lithium ion battery can last for an average of 40 minutes after a four-hour charge. Also, the stainless steel blades are self-sharpening. Whether you want a more traditional wet shaving experience or a portable electric head shaver, you should’ve spotted one head shaver on this list to pique your interested. If you’re on a quest for the best head shaver for your needs, don’t neglect these names from your itinerary. So, what do you think is the best head shaver? Is there one we missed on our list? Please feel free to share your comments on the best head shaver.